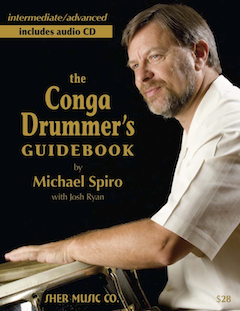 The Conga Drummer's Guidebook is the only method book specifically designed for intermediate to advanced conga drummers — packed with exercises on every aspect of the craft! Two hours of world-class instruction by Grammy-nominated percussionist, author, recording artist and professor, Michael Spiro. Beautifully photographed from three different camera angles, and divided into easy-to-find chapters for convenient replay. This book is the first collected, comprehensive analysis of all these great masters of Latin percussion, giving them the respect and attention they deserve. Getting inside the minds of these artists will help you find your own voice as you become more fluent in the language of Latin Percussion improvisation. Play-along tracks for each etude — first with the solo performed and then with accompaniment only, so you can practice the etude yourself. Michael Spiro's 16-page written overview of how to study these transcriptions and incorporate them into your own playing. Long awaited after the release of Michael's Grupo Ilu Aña record, this book includes songs and transcriptions from the first seven tracks of the album. Not only does it provide lyrics and rhythms, but it also shows them working together as performed with improvisations and drum vocabulary. 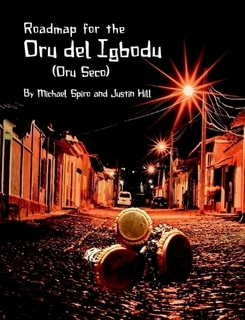 The Oru del Igbodu is a book of bata transcriptions of rhythms from the Cuban province of Havana. The "oru secco" is the first major set of repertoire a new bata player should learn. Although it is quite long and complex, it represents only a small part of the bata repertoire, as the drums also accompany a vast repertoire of songs that actually make up the larger body of music in the religious tradition surrounding the drums. This book is best used as a companion to the bata videos found on www.congamasterclass.com. Talking Drums is three world-renowned drummers who are the first to come together to combine Afro-Cuban and funk rhythms in "melodic" compositions. TimbaFunk is a how-to book not only for drumset, conga, and timbale players, but also for bassists and all instrumentalists who want to understand how these rhythms fit into contemporary music. Talking Drums is a unique percussion trio of three world-renowned drummers who have come together to combine traditional Afro-Caribbean and funk rhythms: funk drumming innovator David Garibaldi, Cuban-born hand drummer Jesús Diaz, and San Francisco Bay area percussionist Michael Spiro. 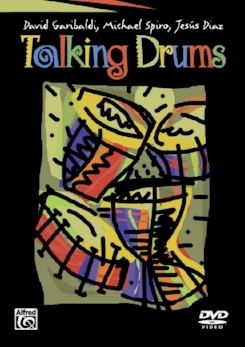 In this DVD, Talking Drums performs and breaks down several exciting compositions that demonstrate the rich rhythmic complexities of this Afro-Caribbean/funk music, offering new ways of approaching both hand drums and drumset. Talking Drums offers a unique teaching approach that clearly explains the intricate workings of Afro-Caribbean rhythmic styles and helps build a better understanding of their history and origin.